Nebuchadnezzar had been shown the kingdoms of men represented by the pleasing symbols of a tall statue and a great tree, in Daniel chapters 2 and 4. 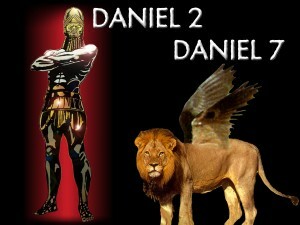 Here in chapter 7, Daniel, the servant of God, is shown these kingdoms as they really are: like dangerous wild animals. The same four empires are shown and this vision supplies more details to what had previously been revealed. The first beast was like a lion, a fitting symbol of Babylon. Many stone lions have been unearthed at Nineveh and Babylon. The outstretched eagle’s wings refer to the territory ruled by Assyria. Wings were plucked when the power of Assyria passed to Babylon, and the addition of a man’s heart means Babylon was more humane than the cruel Assyrians. These powers had ended the kingdoms of Israel and Judah (Jeremiah 50:17). Babylon’s empire covered the Fertile Crescent from the Persian Gulf to the Mediterranean Sea. Another beast, like a bear raised on one side, symbolised the Medes and Persians, with the latter dominant. This empire devoured much more territory than Babylon. A leopard, a swiftly moving beast of prey, indicated the rapidity of the Greek conquest of Persia. Four wings indicate the expansion of the empire of Alexander the Great, and four heads show its subsequent four-fold division under four of his generals. The lion, the bear and the leopard (Daniel 7:4-6) correspond to the gold, silver and bronze parts of the image in the king’s dream (2:32, 38-39). The dreadful and terrible fourth beast had great iron teeth (7:7) and corresponds to the legs of iron (2:40). Iron teeth refer to Roman power. Bronze claws refer to the persistence of Greek culture and philosophy. [Also the two legs of the image relate to the Eastern (Greek) and Western (Latin) aspects of the iron Roman empire]. 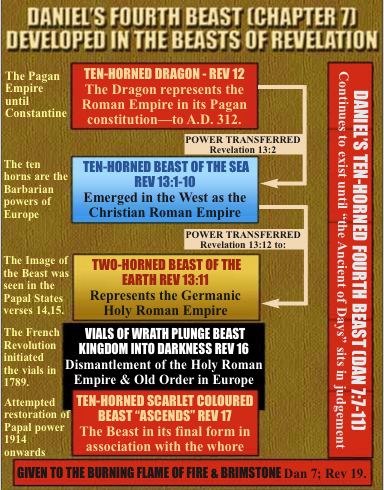 Ten horns refer to the ten barbarian nations that succeeded the Western empire in the 4th and 5th centuries. The things attributed to the little 11th horn, which was in the midst of the ten, are so remarkable and so appropriate to the Papacy that no other application seems possible. As the little horn uprooted three of the horns, so the emerging Papal power took the lands of three barbarian kingdoms. 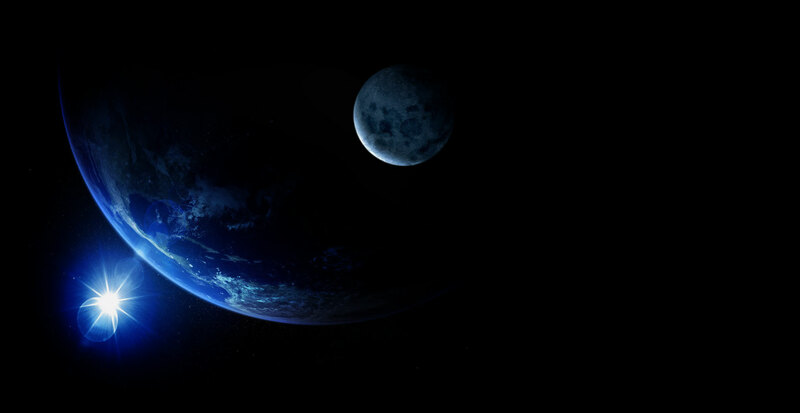 As overseer and spokesman, its eyes and mouth have gone throughout the earth. It spoke “great words against the Most High” (7:25), accepting such titles as Holy Father and the infallibility that belongs to God alone. It made war on the saints and prevailed over them for a period of three and a half times. This refers to 1260 years from AD 533, when the Eastern emperor Justinian acknowledged the Pope as Universal Bishop, to 1793, the date of the “reign of terror” in the middle of the French Revolution, which curtailed the Papal power to persecute. 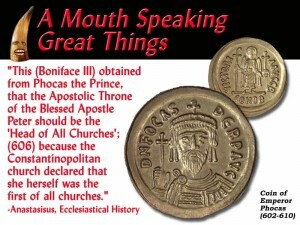 Another Eastern emperor, Phocas, confirmed the authority that Justinian had granted to the bishop of Rome. Some 1260 years later the Papal States were lost and the Papacy was confined to the Vatican. It now professes to work for the reunion of all churches, provided it is recognised as the mother church. It wants Europe to unite under its Christian influence. The Catholic Church, patterned upon the operation of the Roman empire, maintains its institutions in the style of autocratic Rome. Daniel saw that the Son of Man would be given dominion and an everlasting kingdom over all nations, and the saints of the Most High would reign with him (7:13-14, 18, 22, 27). At his trial, Jesus told his accusers that Daniel 7:13 and Psalm 110:1 applied to himself: “Hereafter you shall see the Son of Man sitting on the right hand of power, and coming in the clouds of heaven” (Matthew 26:64). 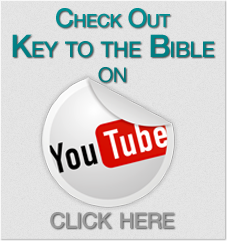 It is abundantly clear that God has ruled in the kingdom of men, and is still doing so. As saints, called out from the world, there is a crown of life laid up for us. Not all of the saints will be chosen, but only those who keep the commandments of Christ. We must keep the vision fresh and alive in our hearts. 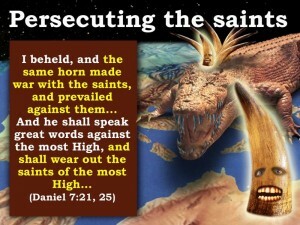 In the symbol of the dreadful fourth beast, God showed Daniel that the power of Rome would continue in one form or other until its dominion is taken away and replaced by the kingdom of Jesus Christ and the saints. The Apostle John, who lived in the time of the Roman Empire, was given many more details of the development of the Roman Beast.